Some people just don't understand the concept of "it's good enough, leave it alone." Originally created as a magical reflection of Princess Diana of Themyscira, Donna Troy became more than Wonder Woman's identical twin "sister" when she was kidnapped and forced to endure a series of alternate lives ending in tragedy. Upon her return to Earth - sans any memories of the experience - Donna adopted the guise of Wonder Girl and joined the first Teen Titans. Since Artemis has previously recounted the sad, stupid tale of Donna Troy's introduction to the Teen Titans, so we won't repeat it here. But go read that other review, because it's rather amusing (and it will boost our traffic stats, which is always nice to see). Besides, recent retcons mean all that stuff in the bio paragraph never happened any more. Instead, here's a different weird fact about her: while Wonder Girl was introduced as her own separate character (rather than Wonder Woman at an earlier point in her life) in 1965, she wasn't actually given a civilian name until four years later! 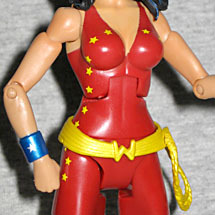 This figure depicts Donna in her third Wonder Girl costume - a slight variation on the second, which had a higher neckline, a medallion and a different pattern of stars. Her belt is a new piece, with the appropriate W buckle and her lasso as a molded piece on the left hip. Her bracelets are molded on the forearms, though mine ended up with two right forearms. It's an error, sure, but not one you can really notice unless you're obsessive. She shares Black Canary's high heels, though not the folded-over boot tops. Hard as it seems to believe, Mattel has more than one woman's body - not all their females are the same mold. The major differences can be spotted in the construction of the hips, and the particular shape of the torso hinge. Donna has what seems to be the "bulkier" body, used by Wonder Woman, Power Girl and Hawkgirl, rather than the "scrawny" body of Harley Quinn, Jayna and Starfire. Want to know how to spot the differences? We'll start with the hips: Donna's are smooth, but Kory's have visible hinge joints. Next, the torso joint: the cuts through Kory's torso are nearly parallel to the ground, while Donna's are angular and more organic. Don't think these are major differences? Well, they're not, but it's still easier to tell these apart than the "large" and "slender" male bodies. 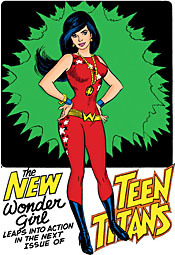 When she first began appearing in Teen Titans, Wonder Girl's face was explicity based on Marie Osmond, at writer Marv Wolfman's suggestion. As she grew, she became more "stately" and less "wholesome and naive." The Horsemen have sculpted her with an unusual expression, with one corner of her mouth drawn back, like she's mildly disgusted with something. The entire face is oddly flat, however. All the DC figures released this year come with small collector buttons. Well, most of the DC figures: JLU was left out, because its shipping schedule is too erratic and unreliable. Honestly, the entire point seems to be to A) make us more willing to swallow the price increase on DC Universe, and 2) to help boost the dismal sales of Infinite Heroes. Those things are a phenominal failure. Anyway, Donna's pin shows a portion of New Teen Titans #1, probably the most famous cover she's ever been on. 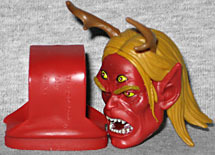 The package includes two pieces of this series' Build-A-Figure, Trigon. She includes the creepy, creepy head, and the giant, formless crotch. The plastic is dark enough that it doesn't look cheap, and though the loins are unpainted, there's lots of good detailing on the head. If you don't want to build the entire figure, you can still pretend this head is just appearing in a prophetic vision or something. Get creative! Donna is one of those characters, like Jean Grey, who seem unable to maintain a codename and are instead just known by their real name. After all, this figure isn't sold as "Wonder Girl," it's sold as "Donna Troy." Her origins have seemingly been in constant flux over the years, and right now it's back to the simple orginal version. Whatever you want her backstory to be, this is a fine figure, and a lot more fun than DC Direct's version.